We’ve recently enjoyed a bit of nostalgia, courtesy of J-World Sailing School. 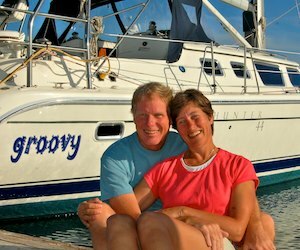 Before we bought our sailboat Groovy and went cruising in Mexico — in fact, even before we bought our first travel trailer and drove off to a life of adventure on the road — we enrolled in two classes at J-World in San Diego that put us on the course to our new lifestyles. We had both sailed before, Mark on Hobie catamarans on Michigan lakes, and I on boats of all sizes in the Atlantic Ocean. 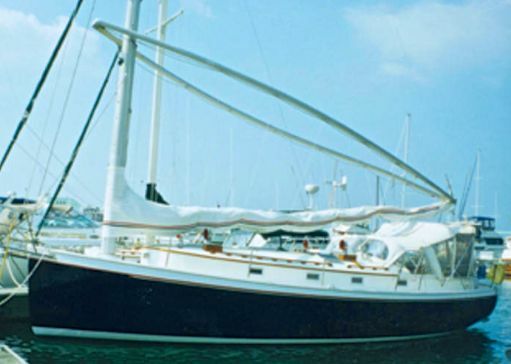 A Nonsuch 36, sistership to “Magic Dragon,” my home for 4 years in Boston. In fact, at one time I had lived aboard a wishbone-rigged Nonsuch 36 (something like an enormous windsurfer with an elegant cabin) in Boston Harbor for four years. What a ride that was — 3 months a year of blissful weekend cruising in New England and 9 months a year of frozen fingers and toes!. When we decided to leave convention behind and see something of this beautiful world, our initial dream was to do it by sea, and we both realized we needed to improve our boating skills if we were going to do that and come out alive. 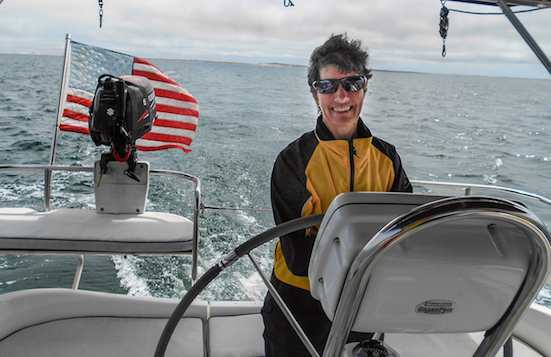 There are many sailing schools in almost every state, and most follow one of two track systems for teaching sailing: the American Sailing Association system and the US Sailing system. We looked into sailing schools in our area, but they were all just Learn to Sail classes on lakes. We needed instruction on handling a large cruising boat on the ocean too. 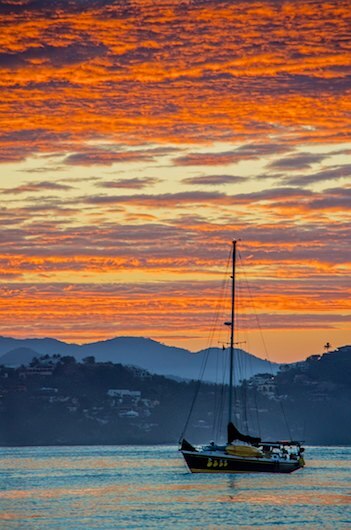 We also thought about flying to the Caribbean for a week or two of instruction, but as lovely as a class at Offshore Sailing School in the BVI can be, it was cost prohibitive. Our solution was to take two back-to-back classes at J-World in San Diego, and what a great decision that turned out to be. J-World teaches the US Sailing curriculum, and they offered a four day Learn to Sail class followed by a three day Liveaboard Cruising class. Even though I had had formal sailing instruction before, I had no trouble going back to square one and learning it all again. That way Mark and I would be on an even keel with each other, and we would both have heard the same words of wisdom and learned the same methods and techniques. Another draw for me was the kind of boat they used for their Liveaboard class. It was a J-120, a boat that intrigued me. 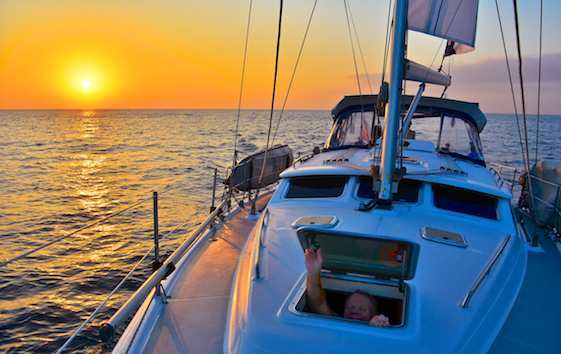 The biggest decision for most sailors before they cast off on their cruise is what kind of boat to buy. This debate had rattled around in my own mind for decades (this cruising dream went back to my childhood). but it’s easy to learn! My very first boat had been a 5′ long plastic skiff when I was a little kid. Despite my mom’s insistance that I stay within her view from the beach, I had rowed that thing long distances. I had taken it far from view, imagining myself a skipper on the vast ocean, fighting off pirates and communing with seabirds. The conventional wisdom among old salts is that a big, heavy, solid, “seaworthy” boat is what you need for a proper cruising adventure. 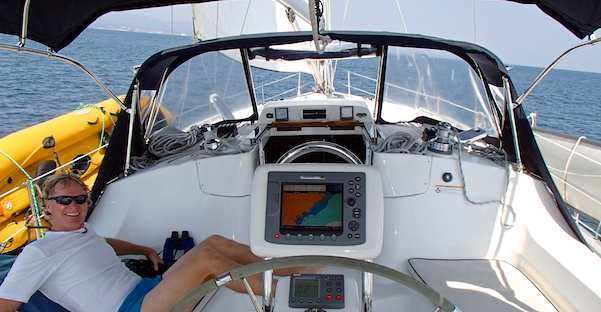 But a yacht broker in Marblehead Massachusetts who had circumnavigated as a young adult had convinced me decades ago that a boat that sails well and sails fast in light air is a really great choice. Of course, there is no “right” or “wrong” boat for cruising. Friends of ours who sailed from San Diego to Mexico and on to the South Pacific have regaled us with tales of cruisers that are out there on all kinds of floating tubs. 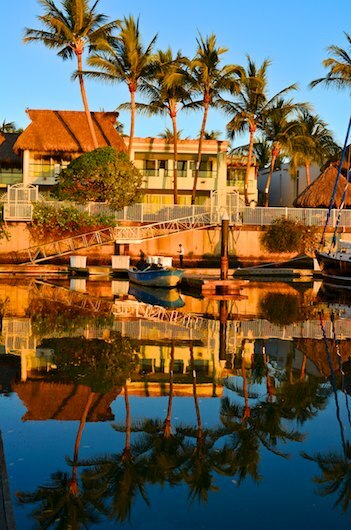 Paradise Village Marina at dawn. From multi-million dollar yachts to the Norwegian couple who has no plumbing at all on their boat (which means, of course, no head since leaving Norway!! ), sailors cruise in anything that floats. But I like the idea of a boat that is a joy to sail in light air, and the J/Boats line of racing/cruising yachts had fascinated me for years. When I lived on the Nonsuch I dreamed of a J-40. When a newer model J/Boat in that size was built — the J-120 — my dream got an upgrade! 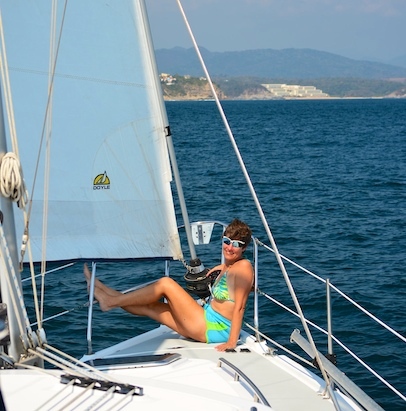 So, when I saw that J-World’s Liveaboard class was conducted on a J-120, that cinched the sailing class deal for me. Not only did I get to see the boat in action, both under sail and as a living platform, but Mark and I both received absolutely top notch instruction from two different teachers. One instructor made sure we could maneuver under sail on and off the docks and in and around a crowded anchorage, and the other ensured we understood the operation of a large cruising boat. Now that we are J-World alumni, we receive their newsletters. When one came a few weeks ago, Mark decided to reach out and let the school know how their classes had launched us into the cruising lifestyle. They were delighted to hear from us and wanted to know more about our experiences in Mexico. We exchanged a few emails, and then they decided to highlight our story on their blog. What fun!! Thank you, J-World, for your terrific instruction and for being our first stepping stone into a life afloat! New to this site? 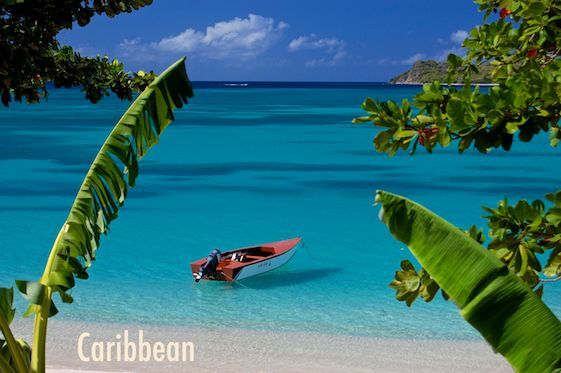 Visit our Home Page to learn more about us, and see our Intro for Cruisers to find out where we keep all the good stuff, including tips for planning your cruise to Mexico, our Solar Power pages, and our ideas for outfitting your boat. This entry was posted in News and tagged New, Non-Travel, Travel Guides by Roads Less Traveled. Bookmark the permalink.